The Chelsea striker was hit with a three-match suspension following his actions in a League Cup clash with Liverpool. DIEGO COSTA SAYS he only makes “noble” challenges on the pitch, despite his three-match ban for stamping on Emre Can. The Chelsea striker missed clashes with Manchester City, Aston Villa and Everton after being hit with a violent conduct charge by the Football Association following the Blues’ League Cup semi-final win over Liverpool. However, the Spaniard insists that he has never injured a player on purpose, and says he is slowly adjusting to the physical side of the English game following his summer move from Atletico Madrid. “Yes, I am getting used to getting kicked more than before,” he told Sport Magazine. “Premier League defenders are really strong and physical. In England, the referees don’t call many fouls, as opposed to Spanish football. Consequently, you must be really strong all through the 90 minutes. “Some of the kicks I suffer in England would be punished with a red card in Spain. My challenges on the ball are strong but noble at the same time. If you check my records, you will find out that I’ve never caused a bad injury to any player. Chelsea remain seven points clear at the Premier League summit, and face Paris Saint-Germain in the first knockout round of the Champions League before their clash with Tottenham in the League Cup final. 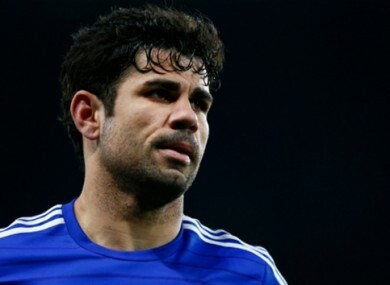 But Costa insists the club must continue to improve if they are to realise their full potential. “Winning titles,” he answered when asked what would constitute a good season. “That’s exactly what a good season means for a club with this grandeur, players and trophy-winning manager. “But we must keep on improving, which is what the manager demands for each game. If we put our game into practice, we are going to fight for every title. We must be ourselves. Email “Costa: 'In England, the referees don't call many fouls, as opposed to Spanish football'”. Feedback on “Costa: 'In England, the referees don't call many fouls, as opposed to Spanish football'”.